"Officers had their watches in their hands, and the troops waited with the same grave composure with which they had fought." As watch hands reached 11, "there came a second of expectant silence, and then a curious rippling sound, which observers far behind the front likened to the noise of a light wind. It was the sound of men cheering from the Vosges [mountains] to the sea." John Buchan. John Buchan (26 August 1875 – 11 February 1940) was a Scottish novelist, historian and Unionist politician who served as Governor General of Canada. Author of 'The 39 Steps', a spy-thriller set just prior to World War I. Note the 2 young girls in the picture proudly displaying their wristwatches. The image is from The First World War Poetry Digital Archive, at the University of Oxford. The picture was taken circa 1915, and shows some young children dressed up as WW1 soldiers and nurses at Lime Walk, Headington, Oxford, England. ​Good example of a propaganda poster from WW1. See below for more entries and agitprop. According to http://www.ww1propaganda.com this is a Service Series poster promoting the First Division as a unit that works around the clock, showing half-length drawing of a soldier, holding rifle, on the face of a clock. LOC Notes: "Special" issue of "Service Series" posters. Date Created/Published: ca. 1918. 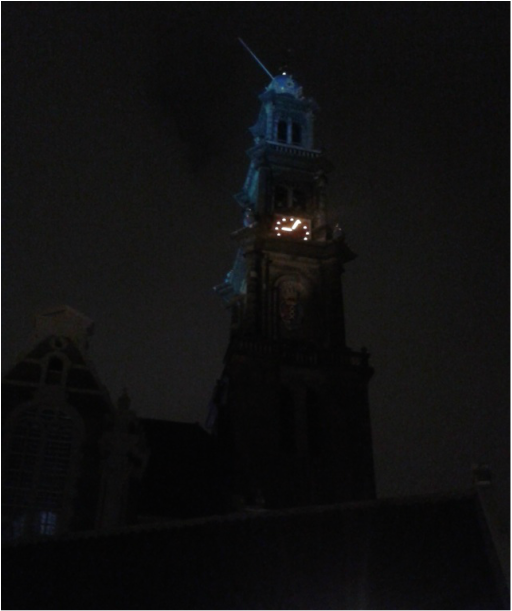 ''We’ve all been a little confused this past week because our dearly beloved Westertoren bells have been carted off to be melted down for the war, so we have no idea of the exact time, either night or day. I still have hopes that they’ll come up with a substitute, made of tin or copper or some such thing, to remind the neighborhood of the clock''. Anne Frank: August 10, 1943. The Westertoren bells are mentioned several times in Anne’s diary. The tower clock was one of the few things that could be seen from the attic of the hiding place, and several times Anne wrote that the chiming of the clock every quarter-hour gave her comfort. Annelies Marie "Anne" Frank 12 June 1929 – February 1945. Anne is one of the most discussed Jewish victims of the holocaust. Her wartime diary; 'The Diary of a Young Girl' has been the basis for several plays and films. Born in Frankfurt in Germany, she lived most of her life in or near Amsterdam, in the Netherlands. Although a German national, Anne lost her citizenship in 1941 and thus became stateless. Anne acquired the diary on Friday, June 12, her thirteenth birthday. Her writings initially detail a typical young girl's perspective of life. However, they develop to vividly and painstakingly record her experiences of fear, loneliness and isolation, hiding and assisting other persecuted Jewish people in her father Otto's place of work at 263 Prinsengracht, during the German occupation of the Netherlands in WW2. Anne, and those she hid with for 25 months were ultimately discovered and imprisoned. She succumbed to the conditions of Bergen-Belsen concentration camp toward the end of February 1945. Anne gained international recognition posthumously, after her diary was found and published. We recently visited Amsterdam in Holland, and made a specific trip to the House of Anne Frank. It was one of the most moving and emotional experiences. We can totally relate to her frequently diarised comments about the chimes of the local clock bringing her comfort. This is a theme that recurs and literally chimes throughout this archive; a timepiece bringing some sort of reassurance and certainty to an otherwise desperate and chaotic situation. On the left is an image of the attic room, from where Anne would have seen and heard the Westertoren clock tower. Below; 2 images of the clock tower taken on 17 September 2015 - whilst we were in Amsterdam. It is chillingly poignant to be able to connect a sight and sound that was shared by Anne during such turbulent times. Right; image of the Westertoren clock tower from an angle that Anne may well have viewed. A timepiece 'her faithful friend' - from which Anne derived so much comfort during her time spent in the attic of the 'secret annexe'. An atmospheric night-time image of one of the few sources of comfort during Anne's time in the attic room. Indefatigable sinking after being struck by shells from 'Von der Tann'. 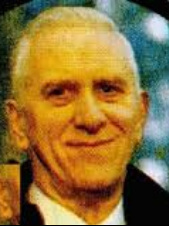 Image of Charles Farmer from 1963 inserted. ​Quote from Leading Signalman Charles Farmer. 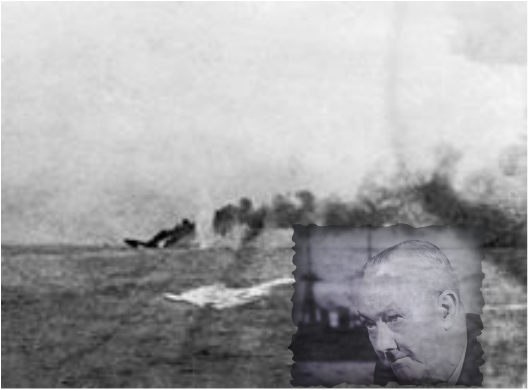 ​One of only 2 survivors from HMS Indefatigable (pictured left) during The Battle of Jutland -the largest naval battle of WW1. Around 4:00am, Indefatigable was hit around the rear turret, by two or three shells from Von der Tann. 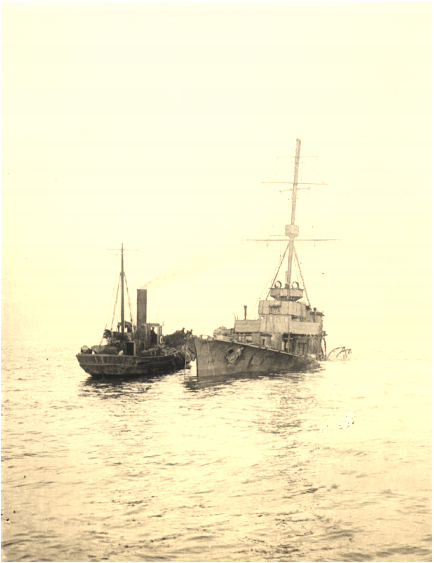 She fell out of formation to starboard and started sinking towards the stern and listing to port. Her magazines exploded at 4:03 after more hits, one on the forecastle (the forward part of a ship below the deck, traditionally used as the crew's living quarters) and another on the forward turret. Smoke and flames gushed from the forward part of the ship and large pieces were thrown 200 feet (61.0 m) into the air. Quote from author of 'The Clocks', Dame Agatha Christie, one of the world’s best-selling authors. Agatha Christie created iconic characters including Hercule Poirot and Miss Marple. Her books and plays sold over one billion copies and inspired dozens of films and television series. Dame Agatha joined the Voluntary Aid Detachments (VADs) in October 1914. County branches of the Red Cross had their own groups of volunteers. Voluntary Aid Detachment members themselves came to be known simply as ‘VADs’. Made up of men and women, the VADs carried out a range of voluntary positions including nursing, transport duties, and the organisation of rest stations, working parties and auxiliary hospitals. See below left for her VAD card details. It is believed her experience as a dispenser with the Red Cross provided Dame Agatha with the accurate detail of the poisons often used to great effect in her story lines - including that of The Clocks. Note the typical early 20th Century artwork of the Red Cross recruitment poster below right. 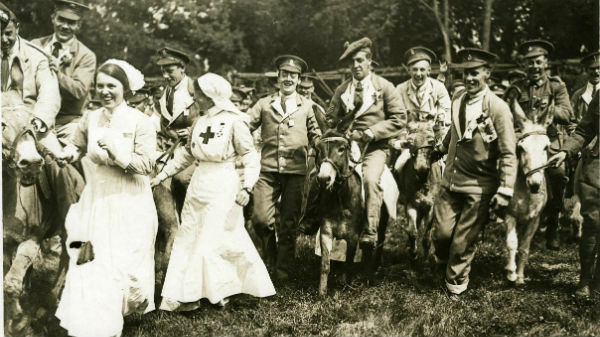 Some VAD nurses take some well earned time out to help entertain the troops during WW1. 'HMS Arethusa was commissioned in August 1914. She was an Arethusa class light cruiser and was the flagship of the Harwich Force commanded by Commodore Reginald Tyrwhitt. Her first action was on 28 August 1914 at the Battle of Heligoland Bight where she sustained serious damage. She also took part in 1915 in the Cuxhaven raid and later the Battle of Dogger Bank. My Grandfather Lieut. Herbert W Edwards joined the Arethusa in 1916 and became Gunnery Officer. On the evening of 9 February the Arethusa was being refuelled (she was the latest diesel engine warship) when a signal came at about 11pm to put to sea which meant just minutes to cast off from the tanker. Just as the Arethusa was pulling away someone spotted the Commodore's black cat, the lucky mascot of the ship, still on the tanker! Should we go back for it? ', 'We will collect him when we return' said the Commodore. ​The seas were very rough and breaking over the deck. They never found the enemy ships and on 11 February returned for home. At noon on the 11th my Grandfather was invited to inspect the oil furnaces in boiler room No.3. An hour later they struck a mine although at the time thought it could be a torpedo. All the stokers in boiler room No.3 were killed and another stoker was blown badly burned and naked out of one of the funnels. The Commodore ordered no ships were to stop to pick up survivors but one Captain didn't see the signal! (Remember Nelson at Copenhagen). My Grandfather lowered the only lifeboat undamaged and picked up survivors. I believe only 17 men were lost. A day later the broken ship remained on a sandbank off Felixstowe and divers went down and brought up my Grandfather's sextant and pocket watch which had stopped at 14.03. We are still looking for the watch within the family! I remember seeing it at my Grandfather's house at Ryde in the Isle of Wight with other mementoes from the Arethusa which were all displayed together in a cabinet in the hallway. 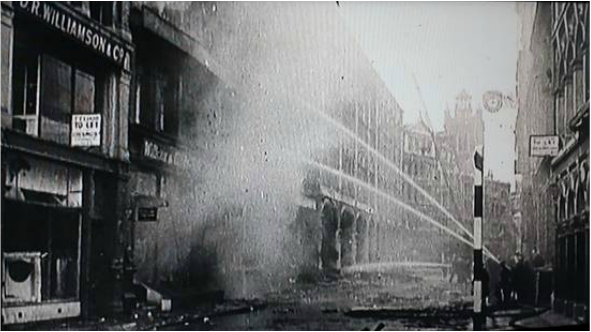 In front of the Albert Clock, Belfast, Ireland, can be seen one of the huge Water Tanks which was utilised during WW2, distributing water around the City of Belfast, to assist in fire fighting following Bombing Raids, not least the Belfast Blitz. The Albert Memorial Clock was built as a memorial to commemorate Prince Albert, by Queen Victoria. It is situated at Queen's Square in Belfast, Northern Ireland. It was completed in 1869 and is one of the best known landmarks of Belfast. The third raid on Belfast took place over the evening and morning of 4–5 May 1941; 150 were killed. Incendiary bombs predominated in this raid. The fourth and final Belfast raid took place on the following night, 5–6 May. ​Pictures kind courtesy of The Ulster Folk Museum and Belfast Telegraph as depicted in 'The Blitz' and 'Bombs on Belfast'. ​On a trip to Branscombe in Devon, we visited St Winifred's Church, to photograph the war memorial. The Church is proud to boast one of very few remaining 'scratch dials' carved into its walls. ​Also known as Mass Dials, these were a very early and primitive form of sun dial. They were used by priests to advertise the time of the next service. They are usually in the form of a semi circle about ten inches across, they were often scratched into the south wall of the church, but with reconstruction this may not always be the case. A hole was bored at the centre and a number of lines scratched from the hole to the arc. The priest would place a short stick in the hole and when the sun shone the shadow of the stick on to one of the lines, the next service would start. In the example left, the Roman Numerals are carved into the wall to the left of the drainpipe (an unfortunate later addition). 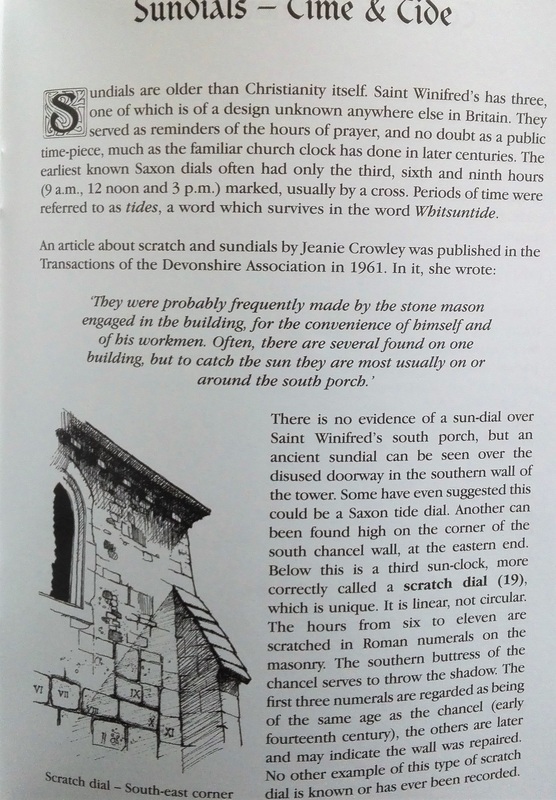 ​The extract taken from St Winifred's magazine below shows how this particular dial operated. 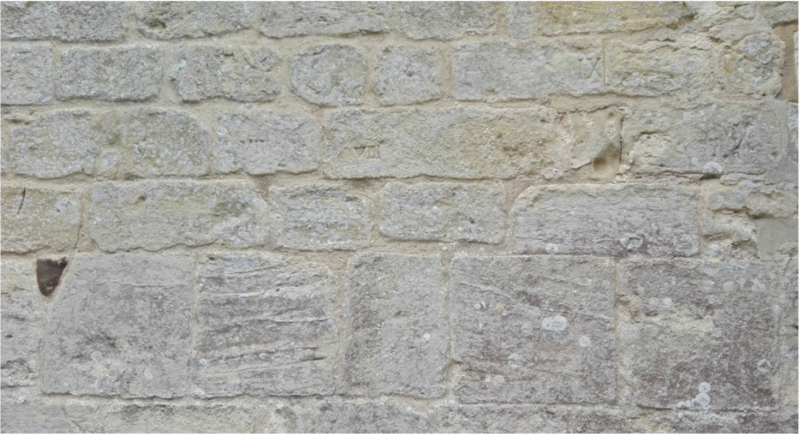 ​Have a look at the close up of the South Wall below, to see if you can spot the Roman Numerals. St Winifred's South facing wall. Look closely for the Roman numerals that remain from the original 'scratch dial'. 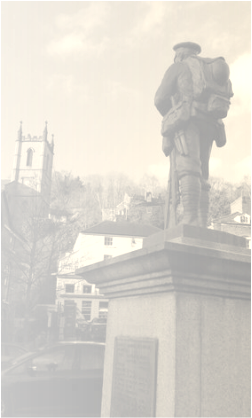 St Winifred's War Memorial, Branscombe Devon. A WORKER WAS CONVICTED on a charge of having attempted to commit fraud by writing up his Time Book and representing that he was at work, when in fact he was absent, AND SENTENCED TO THREE MONTHS' IMPRISONMENT WITH HARD LABOUR. Another WORKER was CONVICTED on a charge of aiding and abetting the foregoing worker by also writing up his Time Book during his absence, and on a further charge of having attempted to commit fraud by representing in his own Time Book that he was at work, when in fact he was absent, AND SENTENCED TO SIX MONTHS' IMPRISONMENT WITH HARD LABOUR. Another WORKER was CONVICTED on a charge of aiding and abetting the last worker by falsely Clocking his Card for him during his absence, AND SENTENCED TO ONE MONTH'S IMPRISONMENT WITH HARD LABOUR. J. C. BURNHAM, SUPERINTENDENT, H.M. FACTORY, GRETNA. 13th August, 1918. Printed under the Authority of His Majesty's Stationery Office by STEEL BROS. (Carlisle), Ltd., English Street, Carlisle'. ​Wells was a prolific English writer in many genres, including novels, history, politics, and social commentary, and textbooks and rules for war games. H. G. Wells playing a wargame with W. Britain toy soldiers according to the rules of Little Wars. Wells is using a piece of string cut to a set length of the distance his soldiers can move. An umpire sits in a chair with his stopwatch timing Wells. Wells' opponent waits for his turn to move and fire his cannon at Wells' soldiers. 6 year old George Batt, sang at Melbourne music halls regularly in order to raise funds for the WW1 effort. He had elder siblings who were away fighting in Gallipoli. Note the trench watch on his wrist, which is almost as big as he is. Harry Leslie Smith. From 'Harry's Last Stand; How the world my generation built is falling down'. Harry Leslie Smith is a survivor of the Great Depression, a WW2 RAF veteran and an activist for the poor and for the preservation of social democracy. More than typical example of an American WW2 propaganda advertisement, encouraging women to make every minute count in the kitchen. This page is taken from an unknown magazine during WW2 showing at least 3 time-saving tips whilst shopping, cooking and feeding baby. See the other entries below regarding propaganda and agitprop in the media and elsewhere. “The Taree War Memorial is in the form of a clock tower made from rock faced granite. A Latin Cross is recessed into the four stone faces of the memorial with a clock fixed to the center of these crosses. At the base of these crosses is an inset marble panel lead-inset with the names of the dead as well as those who had volunteered. The monument faces west and contains a list 36 dead on the main panel. Panels set on the eastern, western and northern face of the monument also contain a list of those who had volunteered. In May 1922, a decision had been made by the Taree War Memorial Committee regarding the building of a memorial. For reasons that are not clear little was done until late 1923 when the Taree war memorial committee held a competition to determine the most appropriate form for a war memorial. A number of designs were submitted and locals were allowed to vote on their preferred design with the votes sold at 1/- for each ballot. First prize with the most votes went to a design comprising of Arch and Gates, second prize went to a monument designed for the intersection of Victoria and Manning Streets, third prize went to a design for a new children's ward at the local hospital, and fourth prize went to a design for a new clock tower. A decision was made in late May 1924 by the committee to select the clock tower and erect it at the main intersection in the town. The Architects were Purnell and Fizelle. (Local stonemasons J.J. Edsteins and Sons were engaged to construct the memorial). The foundation stone for the memorial was laid by the mayor (Alderman W.H. Muldoon) on about the 20th April 1925 and was unveiled two months later on Saturday 6 June 1925 by Major General Cox. At a later date the memorial was moved to Fotheringham Park. Behind the main memorial are a series of polished black granite stele recording later conflicts." The north-western face of the memorial contains a marble panel listing of the thirty-six soldiers who died during World War 1, while panels set on the remaining faces of the monument contain a list of those who had volunteered. In 2013 the Taree RSL Sub-branch and Greater Taree City Council developed a restoration plan, with the aim of having the clock restored for the ANZAC Centenary in 2015. Works included cleaning and re-pointing the memorial, painting the fixtures, a new balustrade, drainage works to remove water from the base and paving improvements to make the memorial accessible. Today the memorial is in great shape to serve as [Taree's] memorial to those who served their country for another 100 years. Members of the WAAF (Women's Auxiliary Air Force) receive training for vital post office work during WW2. "Time only strengthens my conviction that it was a good and strenuous life, and that the war, for all its destructiveness, was an incomparable schooling of the heart.."
Ernst Jünger (29 March 1895 – 17 February 1998) From 'In Stahlgewittern' 'Storm of Steel'. 'Storm of Steel' are the memoirs of German officer Ernst Jünger's experiences on the Western Front during WW1. It was originally printed privately in 1920, making it one of the first personal accounts to be published. The book is a graphic account of trench warfare. It was largely devoid of editorialization when first published, but would be strongly revised several times. Jünger was a German writer and a philosopher also noted for his political essays, novels and diaries. Please see the entries in the Home page relating to Ernst Jünger's accounts in the story 'The Significance of Time Synchronisation During Times of Conflict'. Right; Her Majesty The Queen is presented with a clock. During WW2, Princess Elizabeth joined the Women's Auxiliary Territorial Service where she was promoted to Junior Commander. In this photo, she is presented with a clock on August 3, 1945 during a ceremony at the camp where she received her training. Following a remarkably distinguished military career, In 1979, Lord Mountbatten, along with three others, including his grandson Nicholas, was killed by the Irish Republican Army (IRA), who placed a bomb in his fishing boat, the Shadow V, at Mullaghmore, County Sligo, in Ireland. This image has been provided from the comprehensive collection of Adam Harris. Please see the other entries on the Home page relating to his unique collection. Lord Louis Mountbatten addressing troops on September 11 1945. I’ve been coming to The Keep every Monday since March . On my first day, I was given three large cardboard boxes full of documents that hadn’t really been looked at properly since 1947. It was actually masses of correspondence from an organisation called Mass Observation. I suppose Mass Observation was a kind of social experiment, set up in 1937, where people were asked to write about daily events and what they thought about them. These volunteers were called ‘observers’; they would answer questions – ‘directives’ – sent to them each month by the organisers. My boxes contained a mixture of all the correspondence – directives and news bulletins – sent to observers between 1937 and 1947. I’ve arranged it chronologically by year and created an Excel spreadsheet. Mass Observation became important to the Government after 1939 as it showed how people were feeling about the war, and the questions asked often reflect this. Some of the directives have a real sense of urgency – they ask respondents how they feel about the Blitz, about rationing, or Hitler’s latest speech – and they want them to sit down right away and reply. Then again, some of the directives are a bit bizarre. One asks the observers to keep a dream diary. Another said, ‘Tell us everything you have on your mantelpiece’ and asked for photographs or drawings. That was an interesting one; everyone seemed to have a carriage clock in 1940. Wonderful example of a Mid 19th C, Carriage 'Campaign' Clock by Henri Marc a Paris, from my private Collection [Cathy]. People liked symmetrical arrangements and often arranged things in height order, although one woman, who labelled a diagram of her mantelpiece, admitted she was embarrassed that the vase with flowers in it was off-centre, but it had to be, to cover a crack in the mirror behind. 'The Keep is a world-class centre for archives that opens up access to all the collections of the East Sussex Record Office (ESRO), the Royal Pavilion & Museums Local History Collections and the internationally significant University of Sussex Special Collections. It is also a centre of excellence for conservation and preservation and represents the new generation of archive buildings in the UK'. 'I thought of another relative, my cousin Paul, who I first met in Boston when he was in his sixties. Paul was a tough, plain-speaking sort of guy - a survivor of the war, and of life in general. He was the first adult I ever met with a concentration camp number tattooed on his arm. He had made a new life for himself in the United States. But his most treasured possession was a single, torn-off cover from an old round fob watch [left]. He unwrapped it proudly to show me. It was engraved with a photographic portrait of his grandfather, Moyshe Asch, the family patriarch, who had given all his 10 children an identical watch.Nine of the watches disappeared over time. But at the age of 20, Paul had torn the inner cover off his watch and hidden it inside a window sill in his home in the Polish city of Lodz, before he was deported. He returned as a liberated survivor, persuaded the new occupants of his home to let him in, and retrieved the sliver of metal from its hiding place. HC Deb 03 October 1944 vol 403 c73273226. Mr. Craik Henderson asked the President of the Board of Trade whether he will take steps to provide for the supply of alarm clocks, having regard to the acute shortage which causes inconvenience and adversely affects good time-keeping. Captain Waterhouse; I am aware that there is difficulty but there is a trickle of alarm clocks coming into the country.As I have previously stated, we depend at present almost entirely on imports for our supplies of alarm clocks. During the last twelve months large quantities have been imported from the United States and Canada and have been distributed here. Further supplies are on their way. Mr. Henderson Is my right hon. and gallant Friend aware that it is impossible to obtain alarm clocks in retail shops in most parts of the country? Mr Woodburn; Are arrangements being made to get alarm clocks and watches from Switzerland as soon as communications are open? Capt Waterhouse;That matter is being kept in view. Condescending but typical example of a WW2 propaganda poster playing on the notion of time passing slower in the absence of a loved one, if you are not usefully occupied. Coupled with the recruitment aspect, the poster plays on several emotions at the same time. See the other entries below for a definition of 'Agitprop', which exemplifies the manipulation of emotions. Note the wrist watch to emphasise the passing of time. '...My first Signaller mate there was a pleasant chap, quite a philosopher in his way, probably my senior by four or five years. He showed me photographs of his parents and a sister, and I warmed myself in the glow of love emanating from him as he talked about them and their life together before the war. A good worker too, meticulous in his time-keeping, he woke quickly during the night when the luminous dial on my watch told me four hours had passed and I nudged him to take over. At that point, you placed the headphones and microphone in the other man’s hands, briefly switched on the torch to show him that the combined phone/Morse signal instrument with its buzzer key, earth pin and single landline, and the message pad and pencil were all handy. Then you swapped positions in the hole. On duty or resting, at night you arranged your thick, rubberised groundsheet so that you rested on half of it and pulled the other half over your legs for protection from the cold or rain. When writing down any messages coming in, the groundsheet also came in handy to screen the heavy-duty torch beam. But it was all very difficult and uncomfortable." Nobody Of Any Importance: A Foot Soldier's Memoir Of World War I by Sam Sutcliffe, edited by Phil Sutcliffe, BUY PAPERBACK direct through philsutcliffe47@gmail.com - price £10 + P&P e-book - price £5; all author/editor royalties/'earnings" to the Red Cross. A quote from a survivor of Pickett's Charge during the American Civil War 1861 - 1865. Excerpt from Stephen Kern's; The culture of time and space, 1880-1918. 'Sunday just after mid-night, to be exact early Monday morning 12.45 am, we experienced an earth-quake shock, lasting about three minutes? We were in bed and fast asleep, but the violent swing of our bed owing to the rocking of the house woke us up, & having a light in the room at the time, we could plainly see the effect of the shock in our room. The Gas suspended from the ceiling was rocking like a pendulum of a clock & the boy's bed and mosquito net & frame was in motion'. Above is an extract from the diary of the Day family between 1910-1915 whilst living in Hongkong. For more, see the entry relating their encounter with a Water Clock in Canton in the home page. Six o'clock closing was introduced during the First World War, partly as an attempt to improve public morality and partly as a war austerity measure. Before this reform, most hotels and public houses in Australia had closed at 11 or 11:30 pm. Support for changing hotel closing times originally came from the temperance movement, which hoped that implementing restrictions on the sale of alcohol would lead eventually to its total prohibition. Although the movement had been active since the 1870s, it had been gaining ground since the 1900s following the introduction of 6 o'clock retail trade closing, first legislated in Western Australia in 1897. The slang term 'six o clock swill' came about (drinking heavily toward last orders at 6pm). The argument made by the temperance movement challenged the grounds for public houses being "kept open while bakers' shops were shut". Prominent groups in this movement were the Women's Christian Temperance Union. in which six o’clock closing was decisively endorsed. However, after a subsequent referendum in 1967, closing time was extended to 10 o’clock. Agitation of the prohibition movement was augmented with the outbreak of war in 1914 where it was argued that a "well-ordered, self-disciplined and morally upright home front was a precondition for the successful prosecution of the war''. "Very successful attack this morning... All went like clockwork... The battle is going very well for us and already the Germans are surrendering freely. The enemy is so short of men that he is collecting them from all parts of the line. Our troops are in wonderful spirits and full of confidence." A more than controversial report by Field Marshal Haig on the first day of The Somme attack, 1st July 1916. Douglas Haig was born on June 19 1861, the son of a wealthy whiskey distiller. He was educated at Oxford and Sandhurst. The battle of the Somme was one of the most bloody of WW1, more British soldiers were killed than in any other battle before it. The title 'Butcher of the Somme', was given to Haig, after he, according to many; 'unnecessarily sent thousands of British troops to their deaths'. He died in London on January 28th 1928. Golda Meir (1898 - 1978) Prime Minister of Israel during the Yom Kippur War. Excerpt from "Now It Can Be Told". War correspondent Sir Philip Armand Hamilton Gibbs (1 May 1877 – 10 March 1962) was an English journalist and prolific author of books who served as one of five official British reporters during WW1. 'The men deployed before dawn broke, waiting for the preliminary bombardment which would smash a way for them. The officers struck matches now and then to glance at their wrist-watches, set very carefully to those of the gunners. Then our artillery burst forth with an enormous violence of shell-fire, so that the night was shattered with the tumult of it. ... The men listened and waited. As soon as the guns lengthened their fuses the infantry advance would begin. Then the time came. The watch hands pointed to the second which had been given for the assault to begin, and instantly, to the tick, the guns lifted and made a curtain of fire round the Chateau of Hooge, beyond the Menin road, six hundred yards away. "Time!" The company officers blew their whistles, and there was a sudden clatter from trench-spades slung to rifle-barrels, and from men girdled with hand-grenades, as the advancing companies deployed and made their first rush forward'. 'I stood on the fire-step appalled and probably wide eyed, with the inferno of an attack so near. Nearby was the sardonic CSM. In the presence of men of my platoon he said, with a nasty grin, 'When we go over on the 31st, I'm going next to you Sir'. Somewhat coldly I replied, 'Why sergeant-major?' Then came the punch line - 'Because Sir', he said, 'I like your wrist watch!" This is a wonderful example of a FACTORY BELL TIMER UNIT It was removed from The Whippendell Electric Works in Watford. It is driven by a long case clock mechanism, and used to ring bells for tea breaks, clocking on and off times Etc. They were frequently In use during WW2, and was installed at Whippendell long before that. Commonly known as a "Bell Ringer". The poppy and the pansy blow. . . In Grantchester, in Grantchester. . .
Rupert Brooke is probably best known for the patriotic sonnet ‘The Soldier’ (“If I should die, think only this of me”). Brooke had lived at Grantchester’s Old Vicarage, Cambridgeshire. He died on 23rd April 1915, from an infected mosquito bite, while sailing to Gallipoli as part of the British Mediterranean Expeditionary Force. See also his entry on the Home Page. 11o' clock, that they were prepared at once to withdraw their troops from Poland, a state of war would exist between us... I have to tell you that no such undertaking has been received, and that consequently this country is at war with Germany'. (Arthur) Neville Chamberlain from his radio broadcast, 3 September 1939. Arthur Neville Chamberlain (18 March 1869 – 9 November 1940) was an English, Conservative Party politician who served as Prime Minister of the United Kingdom from May 1937 to May 1940. The moment all of Europe longed for. The radio broadcast at 3pm, on May 8 1945. 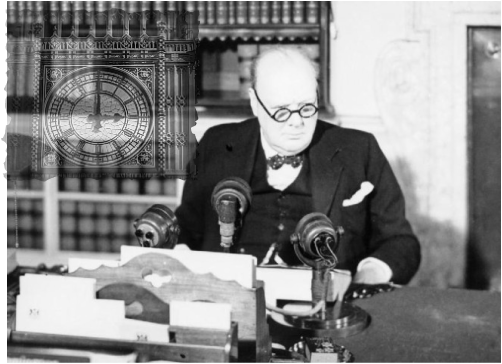 The Prime Minister, Winston Churchill, officially announces the end of WW2 with Germany and... Victory in Europe! In a message broadcast to the nation from the cabinet room at No.10 Downing Street, he stated the ceasefire had been signed at 0241 [7 May] at the American advance HQ in Rheims. It must always be remembered that many soldiers [including my Granddad] were still at war with - and being held prisoner by - the Japanese Army. My Grandfather was still captive in Changi Camp, while the celebrations in Europe took place [Cathy McAnespie]. 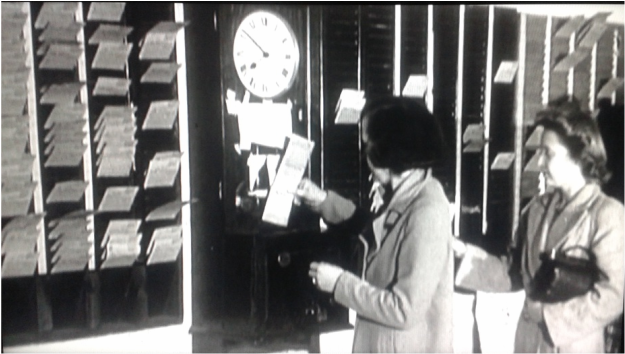 Shopworkers Clocking in (or out) of their shift during WW2. Many women took up employment that was - up to the outbreak of WW1- the predominant domain of men. encouraging Women to undertake the (traditionally male) trades and professions that fell vacant during WW2. This poster appears to be based on the invention of 'Rosie The Riveter' a cultural icon of the United States of America, representing the American women who worked in factories and shipyards during WW2. The character of Rosie appeared in posters, films, radio and other media, and was an extremely effective application of 'agitprop'. The character of Rosie evolved during the war, and became a significant emblem for recruitment of women into the areas of work that had been male oriented prior to war. See the Home Page for more information about this topic, especially the entries relating to the 'Lumberjills'. See below for more references to 'Agitprop'. The following account is taken from the archives of the Republic Drill and Tool Company, Chicago, Illinois, during WW2. Note the agitating 'Big Brother' style banner at the rear of the room. 'A job which was formerly done by hand (and by men) is done in this large Midwest drill and tool plant by women at machines. These young workers are putting precision-ground points on drills which will be used in production of America's ships, tanks and guns. Another agitprop or propagandist poster from WW2 reinforcing the notion of accurate and fastidious timekeeping, and not wasting a second of the working day! Propaganda was expected to work on the mind and conscience. Agitprop (understood to be a Russian notion in origin) was designed to work on the emotions and 'agitate' those reading the literature into action. It appeared to be an extremely useful motivational tool! as if one were needed, that there was a war on! A further graphic (almost 'McGill' seaside postcard style) example of encouraging the population that diligence and time management​ were - at every moment - required in order to prevent giving the edge to the enemy. 'The Chip Scale Atomic Clock seeks to provide complete atomic clock capabilities for weapons, weapon systems and the dismounted Soldier at a fraction of the size. Every U.S. soldier may soon carry a miniaturized, cheaper version of the atomic clocks that ensure navigation and targeting accuracy for bombers and missiles. The atomic time-keeping could not only provide backup for soldiers who temporarily lose GPS signals, but also boost the accuracy for soldier-carried weapons such suicide drones or "smart" grenade launchers. The U.S. military has kicked off the final phase for manufacturing the Chip Scale Atomic Clock — a miniature atomic clock less than 1 cubic inch (15 cubic centimeters) and may end up costing just $300 compared to more expensive atomic clocks in the $10,000 range. "You're not going to put something that expensive in a disposable piece of equipment; however, you can put a $300 component into a piece of equipment that's going to explode," said John Del Colliano, chief for the positioning, navigation and timing branch of the communications-electronics RD&E center at the U.S. Army Research, Development and Engineering Command. Atomic clocks have extremely high accuracy because they use the orbiting electrons of atoms as timekeepers to avoid "drifting" and losing seconds or minutes over time. The U.S. military relies on the clocks to synchronize the timing among different weapon systems and ensure the most accurate location information for units moving around on the battlefield. The precise timekeeping could ensure that GPS receivers recover quickly in scenarios when GPS gets disrupted or jammed, said Paul Olson, a chief engineer at the U.S. Army Research, Development and Engineering Command. It could also protect soldiers against GPS "spoofing" attacks that broadcast false GPS signals in an attempt to fool GPS receivers. "The hope is that the soldier wouldn't even know that his GPS is being jammed," Olson said. The idea of a tiny, cheap atomic clock began with the Pentagon's Defense Advanced Research Projects Agency (DARPA), but has since received funding from the Army, the Air Force and the Office of the Secretary of Defense. About 500 prototype clocks are scheduled for manufacture and delivery in September 2013. But the military hopes that its three contracted private manufacturers can each eventually make more than 20,000 atomic clocks per year to drive the cost down to $300 or less. The spread of such precise timekeeping could benefit more than just the U.S. military — it could also spawn dozens of applications for civilian agencies such as the U.S. Department of Homeland Security or the Federal Aviation Administration within the next two years. Private companies might also begin using atomic clocks more widely in everyday consumer technologies'. This story was provided by 'TechNewsDaily', a sister site to LiveScience. Jefferson Finis Davis (June 3 1808 – December 6 1889) was an American military officer, statesman, and leader of the Confederacy during the American Civil War, serving as the President of the Confederate States of America for its entire history, 1861 to 1865. See his fascinating entries (including those regarding his personal pocket watch) in the home page. Erich Maria Remarque, from '3 Comrades: A Novel of Germany, Between the Wars'. 'All Quiet On The Western Front' 1929. Remarque's biography is essentially marked and his writing fundamentally influenced by German history of the twentieth century: Childhood and youth in imperial Osnabrück, World War I, the Weimar Republic, and most of all his exile in Switzerland and the United States. With the novel 'All Quiet On the Western Front', first published in 1929, Remarque attained world-wide recognition. 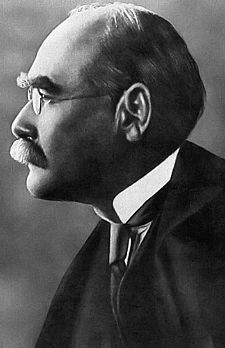 Joseph Rudyard Kipling (30 December 1865 – 18 January 1936) was an English short-story writer, poet, and novelist. He is chiefly remembered for his tales and poems of British soldiers in India and his tales for children, not least 'The Jungle Book' and 'Just So Stories'. In 1907, he was awarded the Nobel Prize for literature, making him the first English-language writer to receive the prize, and to date he remains its youngest recipient. Among other honours, he was sounded out for the British Poet Laureateship and on several occasions for a Knighthood, all of which he declined. 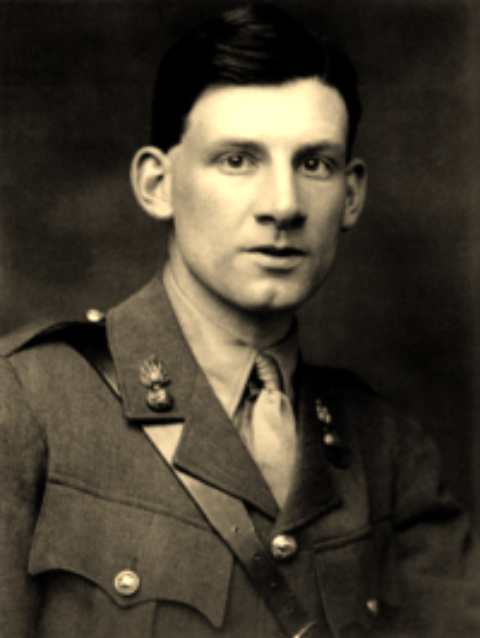 Siegfried Loraine Sassoon, (8 September 1886 – 1 September 1967) English poet, writer, and soldier. He was born in Weirleigh outside of the village of Matfield in Kent. He was Decorated for bravery on the Western Front during WW1. He became one of the leading poets of WW1. His poetry both described the horrors of the trenches, and satirised the patriotic pretensions of those who - in Sassoon's view - were responsible for a jingoism - fuelled war. He later won acclaim for his prose work, notably his three-volume fictionalised autobiography, collectively known as the 'Sherston Trilogy'. As if time were the kind of thing you could run out of, as if it were measured into bowls that were handed to us at birth and if we ate too much or too fast or right before jumping into the water then our time would be lost, wasted, already spent. But time is beyond our finite comprehension. It's endless, it exists outside of us; we cannot run out of it or lose track of it or find a way to hold on to it. Time goes on even when we do not. ―Tahereh Mafi a quote from her series of books 'Shatter me, Destroy me and Unravel Me'. She is a best selling author. She currently resides in Santa Monica, California, where she continues to write. She was born in Connecticut in 1988. “Anger may in time change to gladness; vexation may be succeeded by content. Sun Tzu (circa: 544-496 BC) the author of The Art of War, which is an influential ancient Chinese book on military strategy. Sun Tzu believed in the use of the military sciences to effect outcomes that would result in peace. but the clock in its parody makes it mere change and no wealth'. Rabindranath Tagore (7 May 1861 – 7 August 1941). Bengali poet, writer and Nobel prize winner. '...Beautiful that war and all its deeds of carnage, must in time be utterly lost'. American poet, journalist, and essayist. The work for which he is best known is the controversial 'Leaves of Grass' which had been banned. He has been called the greatest American poet of his time. '...Chiefs who no more in bloody fights engage, But wise through time, and narrative with age, In summer-days like grasshoppers rejoice - A bloodless race, that send a feeble voice'. (21 May 1688 – 30 May 1744) 18th-century English poet. '...I am in all and of all, at the heart of every move in this man’s war. I am the witness of every action, the chronicler of every second that the war ticks on… I am, in this way, the indispensable, the always-to-be-reckoned-with. He was an English poet and soldier, one of the leading poets of the First World War. His shocking, realistic war poetry on the horrors of trenches and gas warfare was heavily influenced by his friend Siegfried Sassoon and stood in stark contrast to both the public perception of war at the time, and to the confidently patriotic verse written earlier by war poets such as Rupert Brooke. Among his best-known works — most of which were published posthumously — are "Dulce et Decorum Est", "Insensibility", "Anthem for Doomed Youth", "Futility" and "Strange Meeting". It depicts 'Miss Ryan' Circa 1909 - purposefully modelling her wide-bracelet wrist watch. The pictures are by John Herman Schmidt. Again, the Wrist Watch almost dominates the picture. In this image 'Miss Johnson' circa 1909 proudly displays her timepiece, and it is very much the focal point of the picture. George Smith Patton, Jr. ( November 11 1885 - December 21 1945) was a United States Army officer best known for his leadership while commanding corps and armies as a General during World War II. He was also well known for his eccentricity and controversial outspokenness. Patton was commissioned in the U.S. Army after his graduation from the U.S. Military Academy at West Point in 1909. In 1916–17, he participated in the unsuccessful Pancho Villa Expedition, a U.S. operation that attempted to capture the Mexican revolutionary. In World War I, he was the first officer assigned to the new United States Tank Corps and saw action in France. In World War II, he commanded corps and armies in North Africa, Sicily, and the European theatre of Operations. In 1944, Patton assumed command of the U.S. Third Army, which under his leadership advanced farther, captured more enemy prisoners, and liberated more territory in less time than any other army in military history. On December 9, 1945, Patton was severely injured in a road accident in Heidelberg, Germany. In the crash Patton received a severe cervical spinal cord injury. Paralyzed from the neck down, he was rushed to the military hospital in Heidelberg. Patton died of a pulmonary embolism on December 21, 1945. The gold pocket watch that once belonged to General Patton and that he is believed to have taken with him onto battlefields early in his military career fetched $137,000 at auction in New York in October 2015. The 1909 Five Minute Repeater by Patek Philippe made for Tiffany & Co was a gift from Patton’s parents for his graduation from the U.S. Military Academy at West Point. The watch had originally been priced at $600 but Patton’s parents purchased it for $350 because “it was thicker than the usual style,” Patton wrote in a memoir in 1927. The watch was sold to an anonymous buyer, according to officials with Dallas-based Heritage Auctions. The watch remained for eight decades in the family of the late general, who commanded the Seventh U.S. Army in the Mediterranean and Europe during World War Two. Patton also commanded the Third U.S. Army in France and Germany following the Allied invasion of Normandy. 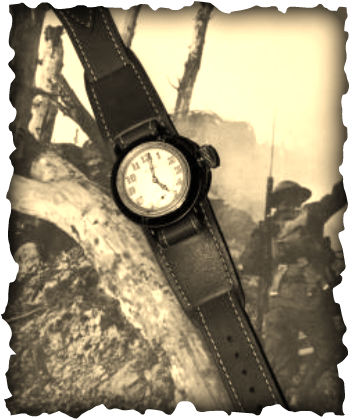 After Patton’s death in 1945, the watch was handed down through several generations. "My wish for the watch has always been that it be cherished as a beautiful timepiece and as an interesting historical memento," said Patton's grandson Robert Patton, who put the watch up for auction. The watch is inscribed “Lieut. George S. Patton USA, from his Father and Mother, June 11, 1909." died April 04, from 'Strength to Love'. King was assassinated on April 4, 1968, in Memphis, Tennessee. He was posthumously awarded the Presidential Medal of Freedom by President Jimmy Carter in 1977. Martin Luther King, Jr. Day, was established as a national holiday in the United States in 1986. In 2004, King was posthumously awarded a Congressional Gold Medal. 'Tennessee' Williams, from 'The Glass Menagerie' (1945). Writer, philosopher, scientist, politician, inventor, and publisher. He helped with the founding of the United States of America and drew acclaim with his discoveries about the principles of electricity. Dwight David Eisenhower, born David Dwight Eisenhower, nicknamed "Ike", was a General of the Army (five star general) in the United States Army and U.S. politician, who served as the thirty-fourth President of the United States (1953–1961). Kurt Vonnegut, from 'Slaughterhouse 5'. Indianapolis, was the setting for many of his novels. He attended Cornell University from 1941 to 1943, where he wrote a column for the student newspaper, the Cornell Daily Sun. Vonnegut trained as a chemist and worked as a journalist before joining the U.S. Army and serving in World War II. Edmund Beckett Denison designed the clock. He worked with Edward Dent on the design. Edward Dent had proposed a clock design, and Edmund Beckett Denison modified it. Dent was a lawyer rather than a horologist. It is believed that he intentionally did not patent his new escapement - which meant other turret clockmakers could use the newer technology for their clocks. The clock mechanism weighs 5 tons. The Clock's timekeeping is strictly regulated by a stack of coins placed on the pendulum. The Clock has rarely stopped. 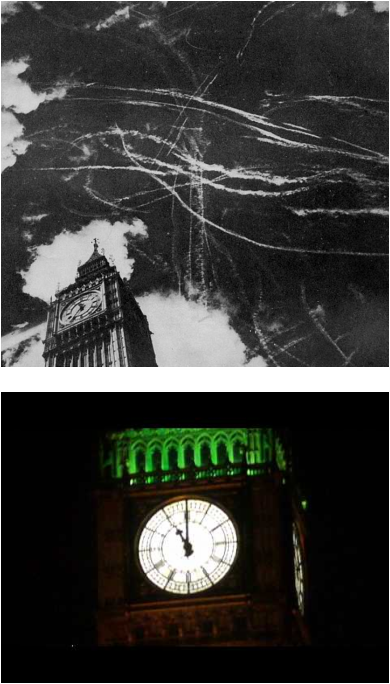 Even after a bomb destroyed the Commons' chamber during WW2, the clock tower survived and it continued to strike the hours. In June 2012 the House of Commons announced that the clock tower was to be renamed the Elizabeth Tower in honour of Queen Elizabeth II's Diamond Jubilee. Eugene B Sledge, from 'With The Old Breed, At Peleliu and Okinawa'. Eugene Bondurant Sledge (November 4, 1923 – March 3, 2001) was a United States Marine, university professor, and author. His 1981 memoir With the Old Breed: At Peleliu and Okinawa chronicled his combat experiences during World War II and was subsequently used as source material for Ken Burns's PBS documentary, The War, as well as the HBO mini-series 'The Pacific', in which he is portrayed by Joseph Mazzello. 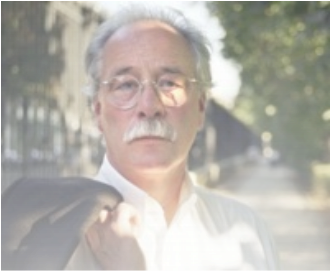 Winfried Georg Maximilian Sebald (May 18, 1944 - December 14, 2001) was a German writer and academic. His works are largely concerned with the themes of memory and its loss (both personal and collective) and decay (of civilizations, traditions or physical objects). They are, in particular, attempts to reconcile himself with, and deal in literary terms with, the trauma of the Second World War and its effect on the German people. Alain-Fournier excerpt from 'Le Grande Meaulnes'. Alain-Fournier was the pseudonym of Henri-Alban Fournier (October 3, 1886 – September 22, 1914), a French author and soldier. “On a long flight, after periods of crisis and many hours of fatigue, mind and body may become disunited until at times they seem completely different elements, as though the body were only a home with which the mind has been associated but by no means bound. Consciousness grows independent of the ordinary senses. You see without assistance from the eyes, over distances beyond the visual horizon. There are moments when existence appears independent even of the mind. The importance of physical desire and immediate surroundings is submerged in the apprehension of universal values. For unmeasurable periods, I seem divorced from my body, as though I were an awareness spreading out through space, over the earth and into the heavens, unhampered by time or substance, free from the gravitation that binds to heavy human problems of the world. My body requires no attention. It's not hungry. It's neither warm or cold. It's resigned to being left undisturbed. Why have I troubled to bring it here? I might better have left it back at Long Island or St. Louis, while the weightless element that has lived within it flashes through the skies and views the planet. This essential consciousness needs no body for its travels. It needs no plane, no engine, no instruments, only the release from flesh which circumstances I've gone through make possible. Then what am I – the body substance which I can see with my eyes and feel with my hands? Or am I this realization, this greater understanding which dwells within it, yet expands through the universe outside; a part of all existence, powerless but without need for power; immersed in solitude, yet in contact with all creation? There are moments when the two appear inseparable, and others when they could be cut apart by the merest flash of light. While my hand is on the stick, my feet on the rudder, and my eyes on the compass, this consciousness, like a winged messenger, goes out to visit the waves below, testing the warmth of water, the speed of wind, the thickness of intervening clouds. It goes north to the glacial coasts of Greenland, over the horizon to the edge of dawn, ahead to Ireland, England, and the continent of Europe, away through space to the moon and stars, always returning, unwillingly, to the mortal duty of seeing that the limbs and muscles have attended their routine while it was gone.” From 'The Spirit of St. Louis'. Lindbergh, a U.S. Air Mail pilot, emerged from virtual obscurity to almost instantaneous world fame as the result of his Orteig Prize-winning solo non-stop flight on May 20–21, 1927, from Roosevelt Field located in Garden City on New York's Long Island to Le Bourget Field in Paris, France, a distance of nearly 3,600 miles. This monumentous achievement was undertaken in the single-seat, single-engine monoplane Spirit of St. Louis. Lindbergh, a U.S. Army reserve officer, was also awarded the nation's highest military decoration, the Medal of Honor, for his historic exploit. In the late 1920s and early 1930s, Lindbergh relentlessly used his fame to help promote the rapid development of U.S. commercial aviation. In March 1932, however, his infant son, Charles, Jr., was kidnapped and murdered in what was soon dubbed the "Crime of the Century" which eventually led to the Lindbergh family fleeing the United States in December 1935 to live in Europe where they remained up until the surprise attack on Pearl Harbor by the Imperial Japanese Navy. Prior to this attack, Lindbergh had been an outspoken advocate of keeping the U.S. out of the world conflict, as was his Congressman father, Charles August Lindbergh (R-MN), during World War I, and became a leader of the anti-war America First movement. Nonetheless, he supported the war effort after Pearl Harbor and flew many combat missions in the Pacific Theater of World War II as a civilian consultant. President Franklin D. Roosevelt had refused to reinstate his Army Air Corps colonel's commission that he had resigned earlier in 1939. Guy Sajer from 'The Forgotten Soldier'. A controversial account of his time spent as a young German soldier on the Eastern Front theatre of WW2. Guy Sajer (né Guy Mouminoux, born 13 January 1926 in Paris). French writer, author of 'The Forgotten Soldier', and cartoonist under the pen names Dimitri, and Dimitri Lahache. The son of a French father and German mother, 'Sajer' is his mother's maiden name.